and my personal, all time favourite: lace edged, polka dot bias binding!! Where does the name Frumble come from? "When we were trying to decide on a name we sat down for a morning and had a little brainstorm. We wanted a name for our business that wasn’t necessarily related to sewing or fabric but something that was only one word long, simple, easy to remember and quite fun to say. Several gallons of tea later, we came up with Frumble and straight away we felt this was a perfect name, it just felt right. After using the name for a couple of months we actually found that the ‘Fr’ in Frumble was a bit of a problem on the phone and no one quite knew what we were saying, so we ended up with a mini tag line we use on the phone. “Frumble, It’s like crumble only with an F” and we found we always gets a bit of a giggle from the person at the other end of the phone." What did you both do in your previous lives? "The Frumble family has a wide range of previous background experiences from product design, civil engineering, fine art, sewing to IT. This broad range of skills makes for an ‘interesting’ mix but we have found that it was more than enough to get us where we are today. We have designed and built the website ourselves, selected all our products and of course, learnt to lovingly package it up to get orders off to the post office in good time. A relatively small family-run team have done this without any external professionals and we hope this organic and nurtured approach is one thing that has helped us to succeed over the last 18 months." What's your criteria for deciding which fabrics to stock? "This is a lot simpler than you might expect. We tend to choose fabrics we like. I think the male and female perspectives sometimes make for an unusual selection of fabric. There are just so many fabrics to choose from out there, so narrowing it down is tricky. If we had an unlimited supply of money and an unlimited supply of space, we would have a lot of fabric. We've been keen to try and find fabric from designers that aren’t readily available. 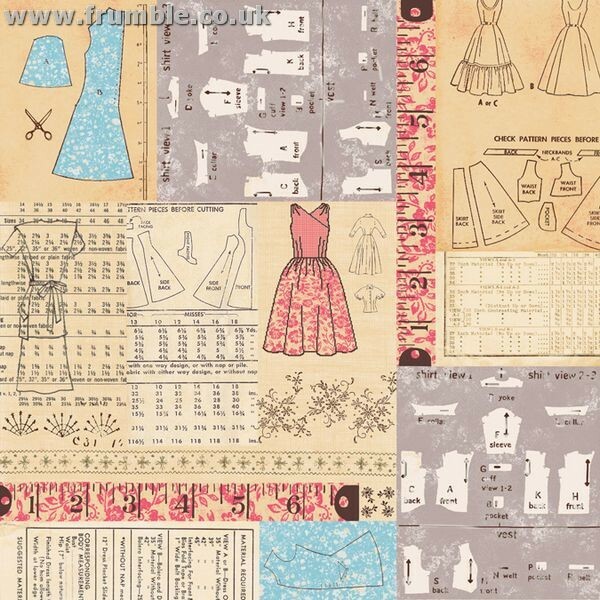 This is hard to do, but we think we've achieved it quite well - we've brought in a large selection of fabric from a new US company called Blend Fabrics, along with our ‘geek chic’ inspired fabrics from Timeless Treasures." 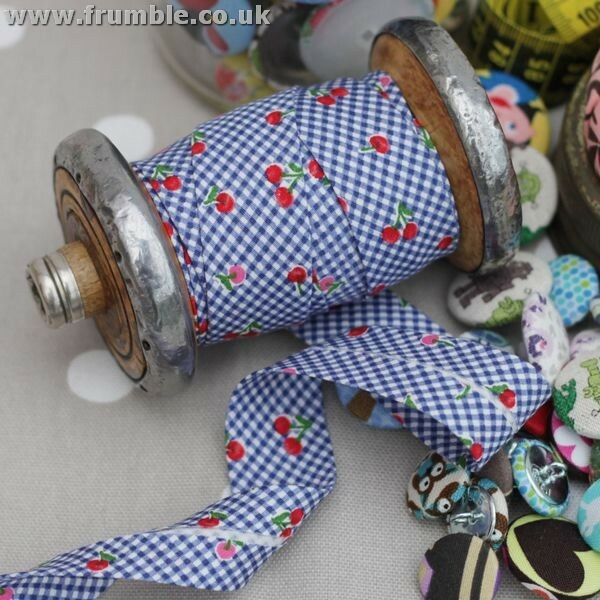 Your haberdashery section is awesome and you've really thought about the finishing touches that dressmakers need. How on earth do you choose what to stock? "We hope that our haberdashery range is fairly unique. We try to offer some of the essentials, but also look for products that are hard to get hold of. We love our new lace edged polka dot bias binding, and have had excellent feedback on it. We also make our own bias binding, which can be fairly time consuming, but we think that it's good to be able to provide something that we've been able to produce ourselves. Our biggest problem is that we have too many new products to share, we have no end of haberdashery queueing up to be listed online! This includes some beautiful, made in England, 100% cotton lace that we think is absolutely gorgeous." Where do you see Frumble Fabrics going in the next year? "We are just about to move into a new business unit, close to the city centre of Birmingham. This should give us a little more space and focus, which we hope will help us develop our brand. We try to offer excellent customer service, as well as little personal touches for our customers. One thing we'd love to continue doing is getting to know our customers. Over the last 18 months, we've been able to build up friendly relationships with our customers and really discover the kind of things they like. We love this kind of customer interaction and hope there's a lot more of it in the future. By opening up an actual space for Frumble, we hope we can meet a few customers in person too, which should be great." Thank you Mat and Monica, I can't wait to see the new lace selection! Frumble have very generously offered a £25 gift voucher to one lucky reader. To enter the giveaway, take a look at the Frumble website and leave a comment on this post saying which fabric you'd choose if you won. The giveaway is open internationally and closes at midnight GMT on Friday 4th May. The winner will be chosen at random. Oooh Jane, how wonderful! And if these lovelies are going to be in Birmingham, that's just up the road from me - happy days! Please enter me for the giveaway - I'd find it hard to choose if I won, but right now I'm leaning towards the Michael Miller Home Ec fabric. What a fun place...it was hard to choose just one...I loved the Canine Chronicles and all the dinosaur fabrics for my grandson. Thanks for sharing this site and a great giveaway opportunity! I like 'Black Cats'! Thanks, Jane. Hi Jane, these are amazing - dare I say too much choice? I love all the quirky retro stuff, but was particularly looking at the Michael Miller Bicycles fabric. I could totally see myself walking in a circle skirt made from it! Epic!!! Oooo, too many to choose from, but the "Cool Cords Strawberry Brown Corduroy" really caught my eye. I'd choose the Bunting Scallop Retro fabric... I think it would make a lovely blouse! I love that 'Organic Fruit Punch Scribble Grid Orange' fabric. I would make a sweet skirt out of that one. I would get the pedal power fat quarter pack. My reason being that it can be quite hard to pick plain fabric that is the best match for your chosen patterned fabric due to the difficulty of seeing colours properly on a monitor and this way it's already done for you! Result! They have a fantastic selection, thank you for pointing them out! I went through the whole lot and found myself thinking "Ooh I like that" lots of times but when I got to the last page I saw the Yippee Retro fabric, and it reminds me so much of a book I had as a child (Little Cowboy Tim) that I think I'd go for that. How difficult to choose between such lovely fabrics. I am torn between the Russian Doll cotton and linen which I adore but wouldn't be able to bring myself to cut in case I ruined it and the Cool Cords Strawberry Brown Corduroy which is good enough to eat. Thank you for providing me with a new obsession. i absolutely LOVE the 'bunting scallop retro' such a fun print while at the same time being nice and subtle to wear. Though to be honest i could probably spend the whole voucher on the gorgeous bias binding! I've never seen anything like that lace edged polka dot! Thank you for pointing out such a fantastic site. Fabulous website, good luck Frumble! I'd go for Lime Groovy Guitars, make myself a skirt then get myself a beatnik boyfriend! I absolutely love Jam Session Black. The print is so sharp and the guitar/music theme is appropriate for my needs. I would use it to make my son a quilt for his bed. I know he's missing his mom, he's broken up with his girlfriend and is feeling sad. Lots of lovely fabric! I love 'The British are coming' with the scooters on it!And the pom-pom trim! I love the Michael Miller fabrics - can't get enough ! how do you choose? I love Michael Miller though and would love some more Gnomeville or Fly away sky. Gosh lots of lovely fabrics, the one that stands out is "Fruit A La Carte - Pineapple" thats the one that is shoutig out buy me, buy me, buy me. I love the charm packs that Frumble do. I've already bought one, I'd love the excuse to buy some more for pactchwork projects of all kinds - maybe to start a new quilt! I actually have 4 yards of the McCalls sewing intructions waiting to be turned into a dress. 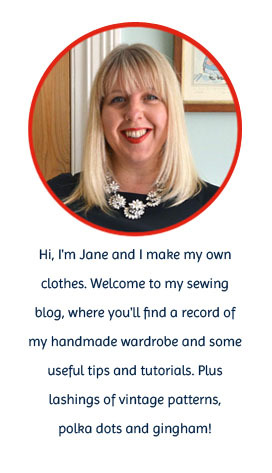 I don't know if it will work but I just love the idea - even if I can't imagine anyone beyond the vintage sewing community getting what it's all about! Just realised that my McCalls pattern fabric is quite different from the one above - I thought the Homespun was an assemblage of fabrics when in fact it's just the one. Cool! How cool! Great interview! I love the Washi beige, but then I am becoming slightly obsessed with triangles and geometric designs at the moment! Hi Jane! Thanks for the lovely giveaway. If I was lucky enough to win I'd go for the Michael Miller Eiffel Tower fabric in blue, but gosh it IS hard to choose as there are somany pretty fabrics. What fun fabrics! Hard to choose just 1, but leaning towards Old Script in either gray or black, or April in Paris Photo Collage, or Dressmakers Collection Labels Multi. what a fab website and the best name ever: Frumble. Reminds me of my nans sewing room. But it was VERY hard to pick just one!!! Ooh, how to choose just one?! Thank you for this lovely giveaway. I hadn't come across Frumble before and they have a great selection! I think Feather N Stitch Birdhouse Light Blue is my favourite. What a great shop! I'd love the Birds of Norway by Michel Miller, such gorgeous colours. Thanks for the great giveaway. What you want me to pick one, well...... I'd have the.... hang on... what about...... the bias binding... or maybe the ripstop (printed ripstop!!!!!)... corduroy.... charm packs.... I don't know!!!!!!! Paris Map Blue. That would make a gorgeous holiday dress!! I just love the colours and shapes. It has a 1970's feel to it that just draws me to it. Thank you so much Jane, you are always introducing me to new experiences and challenges. I have looked out some old patterns and found some lovely pajams. You have awakened the sewing urge in me! Fab! An online fabric shop I didn't know about! I'd love the Michael Miller bird swing in grey. So pretty! Thanks for a fantastic giveaway! Oh wow, so many lovely fabrics, I can't choose a favourite! Loving spring street birds and flowers, tiny town houses and tossed owls in both colours! Great fabrics! I'd perhaps choose some Geo Grand. :) Thank you! Oooh, wow! It's my first time looking though the Frumble website, and me oh my, it's amazing! I'd spend the lot on beautiful bias tape: polka dots, floral, geometic... It's all so great! Oh wow so many great fabrics to choose from, have bookmarked the page, but i reaaly love the Japanese Geisha Dolls in Grey. I would choose the Michael Miller Balloons fabric to make a dress for my daughter, and if I hadn't spent too much the Riley Blake Daisy Cottage charm pack for myself. Love Frumble! Oh my gosh that red Gnomeville fabric is amazing! Imagine a border print skirt or dress of that! Now this is just what I do NOT need, another great fabric source on my radar screen... but since you insist, I quite fancy a skirt for the summer in either blue catch of the day or organic fruit punch. Then again, there's so much to choose from - gorgeous! And that gingham cherry binding is so beautiful! Ohhh, how lovely! I love the "Bite Me Lime" and "Geo Grand Hip Squares" prints. Thank you for hosting the give-a-way! Wow! Awesome website and great giveaway - SO hard to choose. I love the oversized ric rack and the elephant shower fabric, the up and down elephants and the 'honk, honk blue' is awesome along with 'scoot trains toys green'. Fingers crossed!! Oh my,my,my! How to choose! I liked many but i LOVED Kitzbuhl Moonlit Forest Blue and Folk Dance girl white on red by Westfalenstoffe!!! oh jane, i don't know if i could choose! i am obsessed with elephants, and having seen this gorgeous elephant quilt (pinned here: http://pinterest.com/pin/60939401178057657/)which is made of the elephant fabric that i have seen a number of bloggers use... without blatently copying someone else's design, i think the Zoology Rainforest Fat Quarter Bundle could be just gorgeous! This little shop is lovely! I'm really digging all of the bias tape (mostly because I detest making it). However, if I had to choose one fabric I'd choose (oh jeeze)either Pretty Bird in Spice, Pet Deer, Forest Life in Aqua, Birds of Norway, or Bird Swing in Black. Oh you temptress! Maybe I could skip car insurance for a month or so to buy pretties.....or you could graciously get me some cool cords strawberry brown! What a great giveaway! I love all the bias binding options they have! Fantastic shop. Fantastic giveaway. There are so many beautiful things on their site I would love to buy, Forest Life Aqua, Windy Day Aqua and Delectable Multi being only three. I can't limit myself to just one! I'm really sorry, but I can't choose just one fabric, and as i obviously can't choose all of them either, I've settled on two for now. They are bicycle grey and monsters navy. Just gorgeous!! OOoo, I nearly forgot to ask, -please be kind enough to pop me in your hat my dear. I'm keeping everything crossed! Oh I can't visit the site! But I just love that bias binding with the polkadots!! Wow, that's so generous of them, and you for hosting! Ooh, lovely site and I haven't seen lots of those fabrics before. I would pick the Strawberry Brown corduroy for a Ginger skirt. Oh I love Paris Eiffel Tower White and could see me making cushions covers with it because ive got some big prints of the Eiffle tower on my walls already. What a fab giveaway. I'd make a gardening shirt out of the Metro Market Chickens Green. And about a dozen more fabrics. Too many to choose just one favourite. Wow, that's awesome! The fabric is interesting because when you first look at it, it looks just like a great design, but then you see elephants,fish, Christmas presents. LOl what a great online store. Birds of Norway, WAshi in Charcoal, Brick Path Brown, Nesting Hens Blue on White, Daisy Doodle Dandy RIpstop, and it goes on and on . . . Love this site! Ooh, what a beautiful shop! Like you, it's the haberdashery that's stolen my heart. I would order polka dot, gingham, and lace edged bias tape. Heaven! What a wonderful shop. I would love to have the Home Ec fabric. Anything with polka dots is right up my alley too. I ordered some fabric from Frumble a month or two ago, and I can confirm that they dealt with my order very efficiently! They are definitely on my favourites list. Ah, only just realised it's a giveaway! How super! I like Mini Russian Dolls black. Wow, so many fabrics, so little time!! It's a tough call, but I'm loving the Dressmaker's Collection Tools in red - that is so cute! I love all the bias bindings, but especially the dots with lace. And the fabric selection is great, I'd have a hard time deciding. Thanks for the giveaway! I've been having daydreams about a cute little sundress with fruit on it, so I think I'd choose either "Fruit A La Carte Orange" or "Fruit A La Carte Pineapple." Thanks for offering this giveaway! 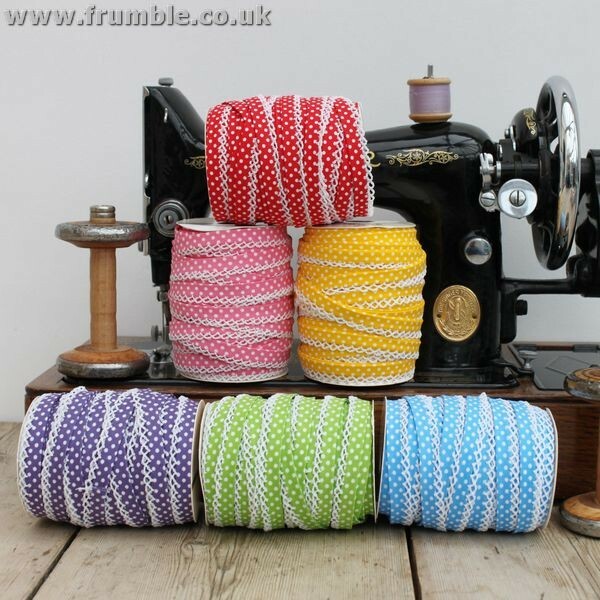 I regularly drool over the fabic on Frumble's website - I discovered it via ebay last year!! 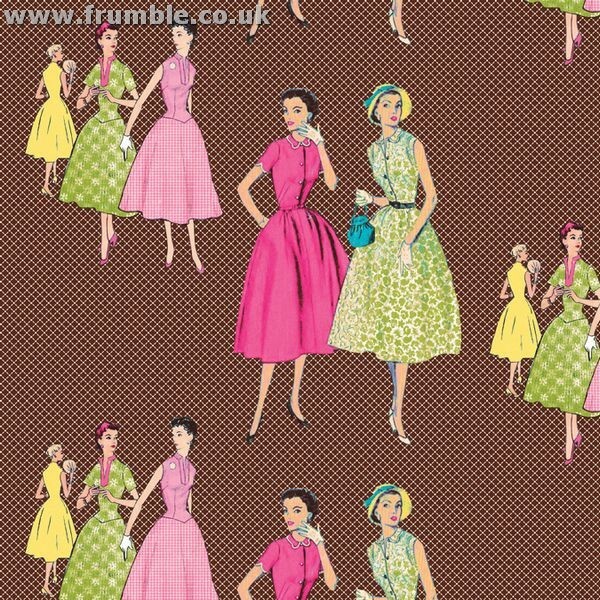 Micheal Millers retro kitties fabric would be my first choice. That Geo Grand Bundles fabric is awesome! Thanks for the chance to win! The Birds of Norway fabric is beautiful. I could do a lot with that! Thanks for the giveaway. The Gnomeville red polka dot border print... I've wanted some for ages to make a cute skirt! 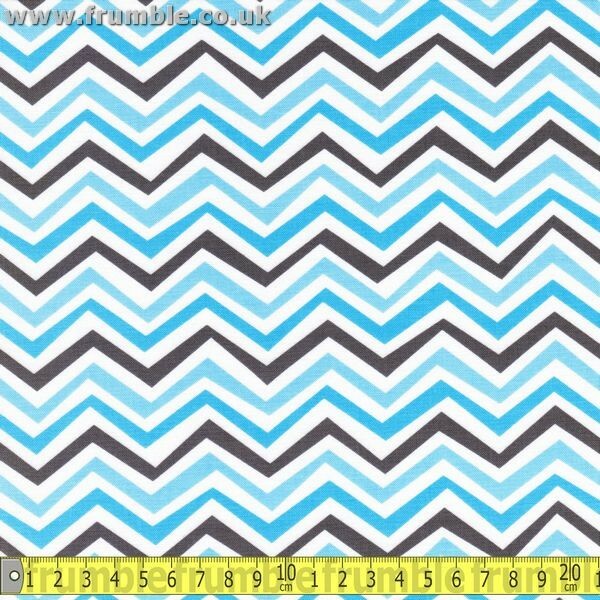 I was going to choose something for my baby, then I realised I am still quite selfish and would love the Bambi Mushroom Blue to make a dress for Me Me Me!! Teacups and roses for me! I'm a teacup collector. I love this print! Eeek! I would love to win this so much. Frumble is my go to for unusual fabrics and actually my fav from frumble is the Timeless Treasures Washi in beige its just fun and the colours are great. Ok, so I know I don't really NEED an excuse to browse through the beautiful fabrics on Frumble's website, but I thought I may as well take a little peek. 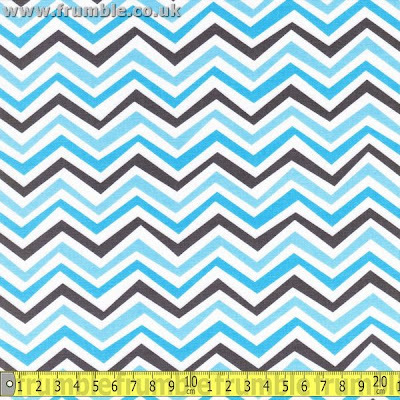 I'm always looking for lovely fabrics to make things for my son, or for fabrics to use in my crafting, but never anything really for ME. So, if I had a magical £25 to spend, I would treat myself to some flowers. Something that I could transform into something beautiful to wear. "Spring Street Flowers Bright" or "Bright Owls Floral Cream", but then there are the robots. Who can resist a robot? Too much gorgeousness! I think if I was forced to choose it would be that vintage-pattern-print fabric or the parisian balck and white photo print with music manuscript etc. The bias binding with lace edging is seriously tempting me! I would choose the strawberry gingham beige,its fresh colour remind me of tea parties in my mum's garden with my doll Lucinda and my dog Amber when i was very young. Bias binding all the way! And maybe the red and black dotty corduroy as well! April In Paris (Photo Collage Ivory) it is. Alone the name makes you want to hop on a plane - even though it's May already. 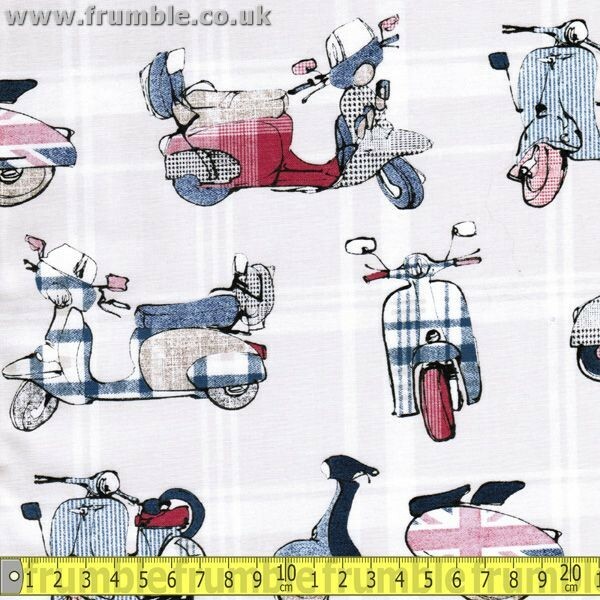 Thank you Jane for introducing us to Frumble - the fabrics are awesome - so many beauties & the habbie too! Seriously swooning. Hmm, Daisy Doodle Dandy would be pretty high on my wishlist... but then so would Too Muchery. Far too much to choose from to be honest! Thanks for the heads-up on the site, have saved it to my bookmarks! Hello! So many amazing fabrics! I especially LOVE Gnomeville, Kitzbuhel Fox & Hare Blue and Bird Swing Grey. Thank you for the giveaway! Love the Bugs in a Jar! But the Flower Fairies would be my pick! I absolutely love the Catch Of The Day Fish in Navy. I have a cute skirt pattern on its way and this would be perfect! What superb fabrics. I think I'd go for the 'love hearts' for a pair of pjs. Thanks for alerting me to the site!